Libby Palmer and Judy D'Amore at the Aquarium, circa 1983. 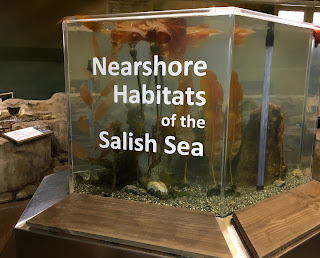 Since its founding in 1982 by Judy D’Amore and Libby Palmer, the Port Townsend Marine Science Center has been actively involved with the creation of programs that foster the health and well-being of marine mammals. In 2018, that commitment takes many forms. Perhaps the best-known program supported by the PTMSC is the Marine Mammal Stranding Network. 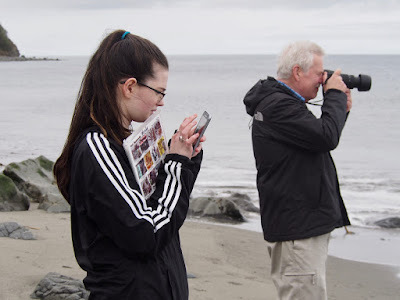 Created by the National Oceanic and Atmospheric Administration following the passage of the 1972 Marine Mammal Protection Act, the MMSN program is robust and boasts support from many citizen scientists. The PTMSC-supported MMSN covers over 100 miles of Washington shoreline from Brinnon to Diamond Point. A stranded marine mammal may be dead onshore or floating in the water, alive but injured or unable to return the water, or alive but unable to return to its natural habitat without assistance. Staff and volunteers respond to stranding reports phoned in to a hotline, keeping shoreline users at a safe distance and collecting data from dead animals. Statistics for 2017 are still being assembled but the network received 141 calls in 2016, and a record of 192 calls in 2014. (The number of calls does not match the number of strandings because multiple reports can come in for one stranded animal.) The highest volume of calls occurs during July and August. 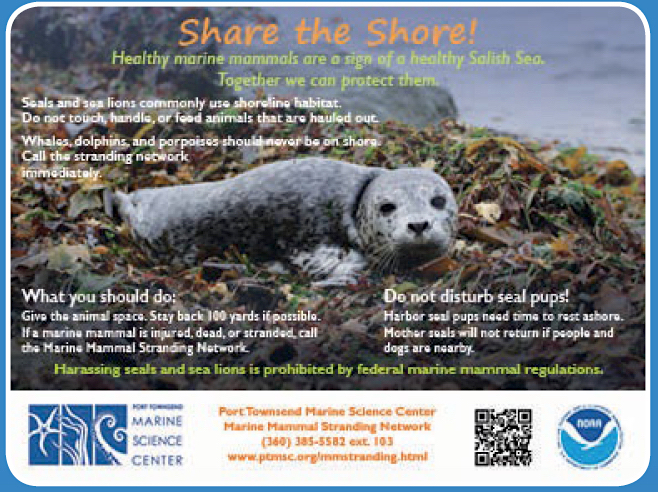 Harbor seals account for approximately 3/4 of reported strandings and, of those, 70 percent are seal pups. 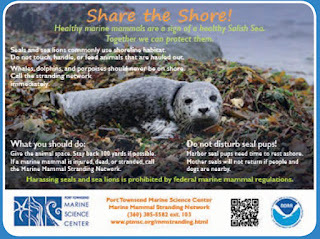 (In the wild, only 50 percent of harbor seal pups survive.) More information is available here. The PTMSC’s established role and capacity in the MMSN was responsible for the organization’s involvement in the 2016 effort to recover the skeleton of a female gray whale. PTMSC and AmeriCorps staff and a number of volunteers assisted in the subsequent necropsy and prepared the carcass for controlled decomposition. The skeleton will be articulated for educational use in PTMSC classes and exhibits, providing insights into the environmental threats affecting gray whales. PTMSC staff, AmeriCorps and volunteers hard at work preparing the gray whale carcass. 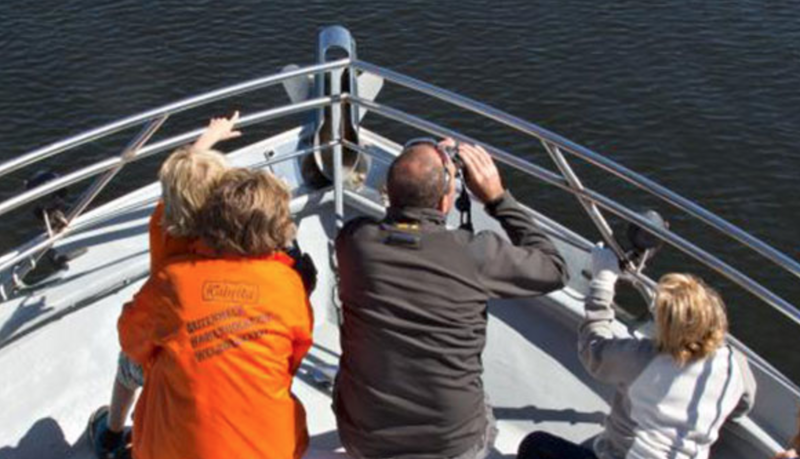 Harbor porpoise monitoring is another citizen science program supported at the PTMSC. The second smallest porpoise in the world, harbor porpoises were once considered the most commonly spotted cetacean in Puget Sound. Their numbers dropped dramatically and by 1970 the species had all but disappeared. In 2015-16, the PTMSC teamed up with the Pacific Biodiversity Institute for an acoustic monitoring study, deploying a crew of volunteers to count the number of harbor porpoises and boats seen off of the Fort Worden pier. 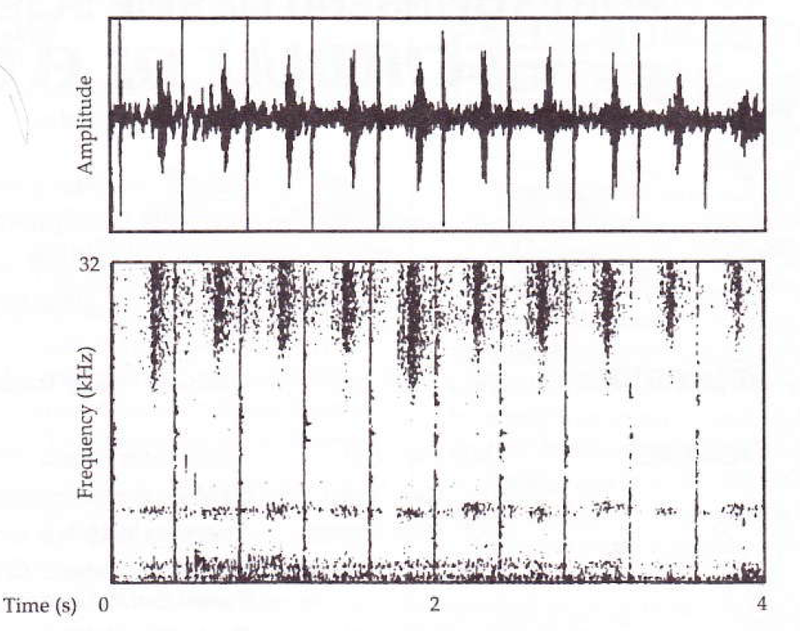 Spotting data is currently being correlated to acoustic data and, while final results are not yet available, preliminary findings suggest that fewer harbor porpoises are observed when motorized boat traffic is present. The PTMSC maintains an active education effort about marine mammals, starting with its website where seals, sea lions, porpoises, whales and otters are described. And the “Toxics Project” provides online education and resources explaining how chemicals, some of which have been banned over 30 years, are still present in the marine environment and causing great harm, particularly to apex predators. 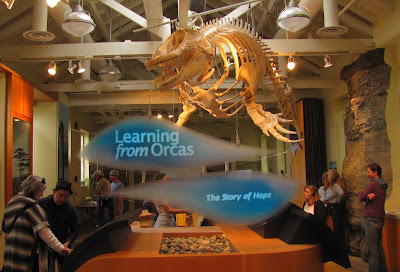 The Story of Hope, a female orca whose articulated skeleton now hangs in the Museum, was the genesis for this project. Classroom instruction and field observation are also taught in PTMSC school programs and at youth summer camps. “Introduction to Marine Mammals” is a 90-minute program offered to youths in 4th grade and above (including adults). The class defines characteristics of marine mammals and investigates marine adaptations using photos, videos, bones, and pelts. Working in small groups, participants examine, make observations and sketch multiple marine mammal skulls. 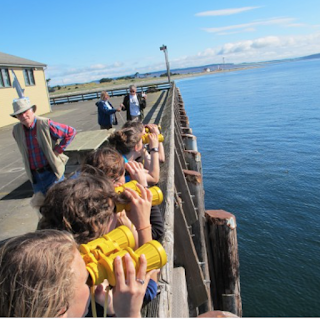 The “Gray Whale” class, offered to the same age groups, teaches students about the biology and adaptations of gray whales. 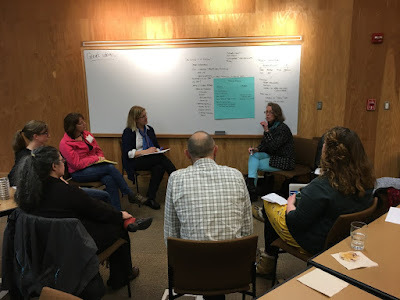 Participants learn about the gray whale’s life cycle, natural history, feeding behavior and migration route north and south along the West Coast. Students also assemble the complete skeleton of a juvenile gray whale recovered by PTMSC volunteers in 1999. "The Sonic World of the Amazonian Pink Dolphin." Finally, while wildlife cruises to the federal Protection Island National Wildlife Refuge spotlight breeding populations of seabirds and shorebirds, it is common for participants to view elephant seals and sea lions basking on the island’s shoreline. Harbor seals also depend upon the island for a pupping and rest area. Naturalists who accompany the cruises provide expert commentary on the habits of these marine mammals and their importance on the island’s ecosystem. Wildlife cruises to Protection Island offered in partnership with Puget Sound Express. Throughout the 2018 GiveBig campaign, we are sharing the inspiring stories of the PTMSC’s support for marine mammals. 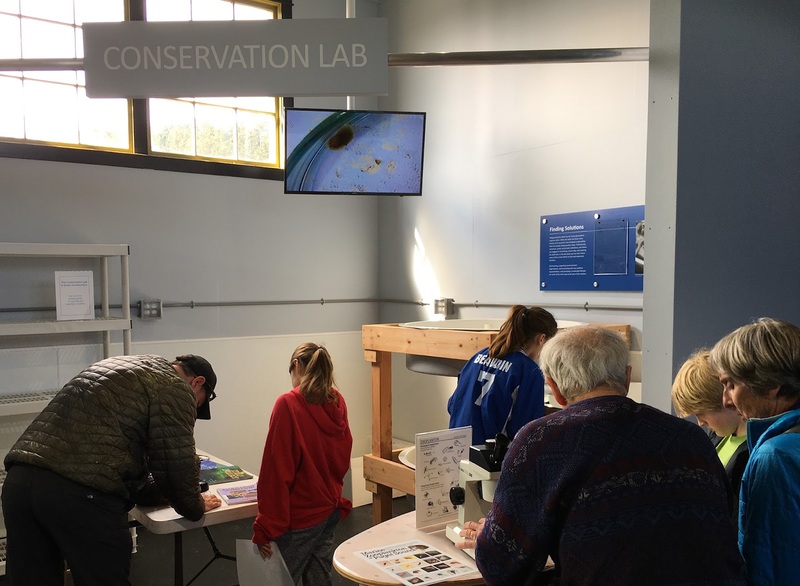 Plan your donation now to support place-based, people powered, hands-on learning at the Port Townsend Marine Science Center. Knowledge is power, and together we can inspire even more people to conserve the Salish Sea! Read Part 1 here. 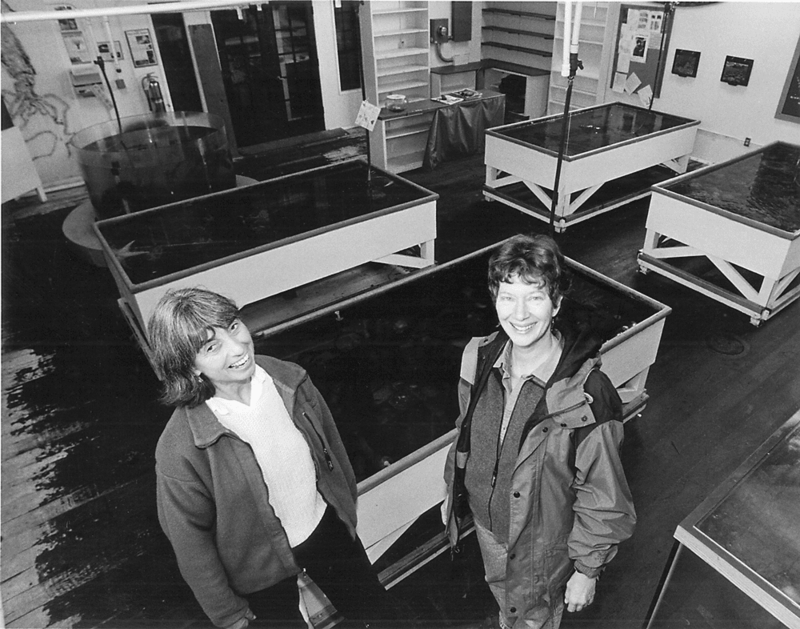 Throughout the 1990s, whales generated increasing interest among the Port Townsend Marine Science Center’s members and supporters. In the Fall 1997 Octopress newsletter, docent Chuck Louch contributed a fascinating account of humpback whales lunge feeding in Frederick Sound during a boating trip he took along Alaska's Inland Passage. 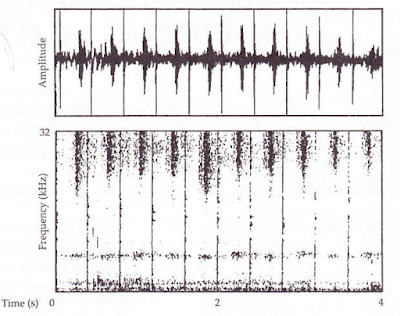 One year later, Louch wrote an informative essay about the echolation patterns of resident and transient orcas. In the Fall 1999 Octopress, PTMSC Volunteer Coordinator Anna Bachmann described the organization’s first foray into flensing (the practice of removing tissue from the skeleton of a carcass). 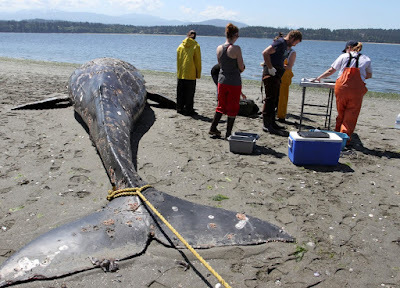 A deceased 25-foot gray whale had washed ashore on a beach facing Protection Island on July 5. It was one of dozens of gray whales that washed up on Puget Sound beaches that summer for reasons unknown. On Aug. 8, with the permission and supervision of the appropriate state and federal agencies, a crew of 20 volunteers, swathed in rubber gear and armed with an assortment of carving knives -- even a machete -- made their way to the young whale's remains. Their mission was to remove and bag up all the bones for further cleaning. The whale was so advanced in its decay that the bones were almost falling out and, in just five hours, the primary job was done. The bones were then sown into net bags and submerged to allow shrimp, crab and other detritus eaters to clean the remaining flesh away. After coating the bones in a protective “glue,” they became an integral part of the PTMSC’s classroom display in the Museum, where they are still used today in for education purposes. Students were immersed in orca education for three days, learning about plankton, marine food webs, orca communities, marine mammals, and more. Students engaged in classes which pushed them to think differently, ask questions, and form conclusions, much like real scientists. In the program’s final day, students used forensic techniques to determine the demise of PTMSC’s orca “Hope” and participated in a mock town hall meeting about tidal turbines in Admiralty Inlet... The experience equips students to participate in important decisions about their local environment and seek careers in science fields. If it seems the PTMSC cannot get enough of whales, look no further for validation than the most recent skeleton articulation project on tap. In April 2016, a juvenile female gray whale in distress was repeatedly sighted in central Puget Sound and eventually died. The whale’s carcass was towed to a site on Indian Island provided by the U.S. Navy. PTMSC and AmeriCorps staff and a number of volunteers assisted in the subsequent necropsy and prepared the carcass for controlled decomposition. The PTMSC plans to articulate the skeleton for educational use in its classes and exhibits, providing insights into the environmental threats affecting gray whales. The litter of plastic trash, becoming commonplace on even our most remote beaches, poses a serious threat to wildlife, which fortunately is gaining some much-needed attention. Heartbreaking images of birds and mammals entangled in our familiar misplaced trash are beginning to reach us all, reminding us of the tragic effects of our society's carelessness with its wastes... Our recent love affair with cheap, convenient, non-recyclable products has had enormous unseen costs, only one of which is the problem of the pollution of the marine environment. The newsletter noted that nearby residents are already taking positive steps. Locally, the City of Port Townsend and Jefferson County sponsored a Spring Clean-up Rally from April 16-31st. Volunteers of all ages from numerous community groups hit the roads, parks and beaches with trash bags, in what will hopefully become a yearly event. Indeed, the event is now part of the annual Port Townsend Earth Day Beach Clean Up, sponsored by the PTMSC and Washington Coastsavers in support of International Coastal Clean-Up Day. Last year, however, we were visited by two migrating Northern Elephant seals... Elephant seals molt every summer. They haul out (come ashore) to shed skin and fur in patches. They do not eat during the molting, which takes about three weeks. The ill look is normal. They rest on shore and cool off in water. Water quality and biological conditions may cause a molting Elephant seal to haul out in unusual places. It was remarkable to see one hauled out at Ft. Worden since they generally prefer more remote islands and the outer coast. A very young seal, like the one we observed molting here, may not know the rules yet. 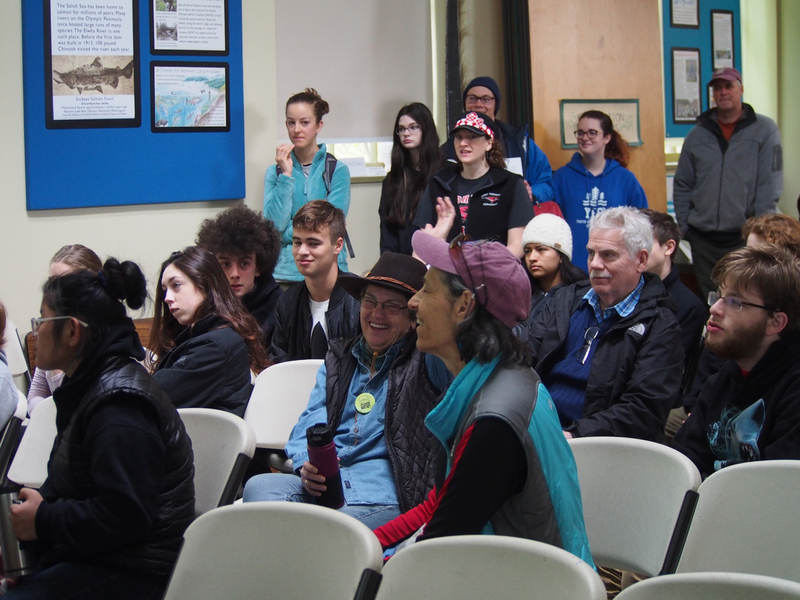 While unusual, there would be more opportunities in the coming years to educate Port Townsend’s residents about elephant seals. 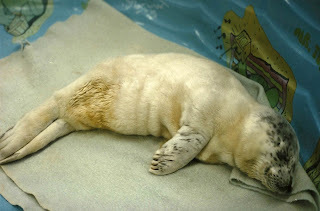 Danae Presler, the AmeriCorps MMSN educator working at PTMSC in the spring of 2013, described how residents of a downtown apartment complex were startled to find a 400-pound seal on their back patio, in this PTMSC blog posting. Throughout the 2018 GiveBig campaign, we are sharing the inspiring stories of the PTMSC’s support for marine mammals. 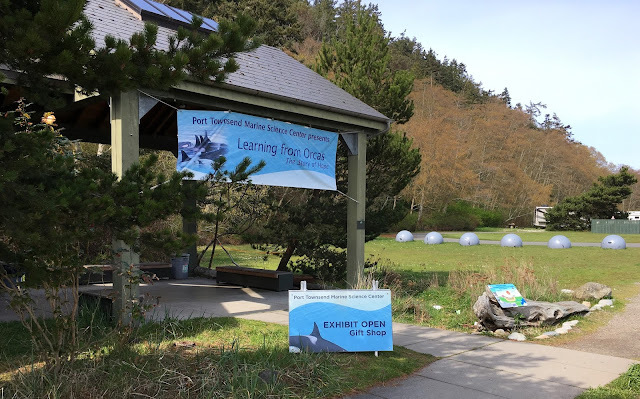 Plan your donation now to support place-based, people powered, hands-on learning at the Port Townsend Marine Science Center. Knowledge is power, and together we can inspire even more people to conserve the Salish Sea! Read Part 2 here. The Port Townsend Marine Science Center has a long history of supporting marine mammal education and protection, as well as advocating for programs and policies that safeguard their health and well-being. 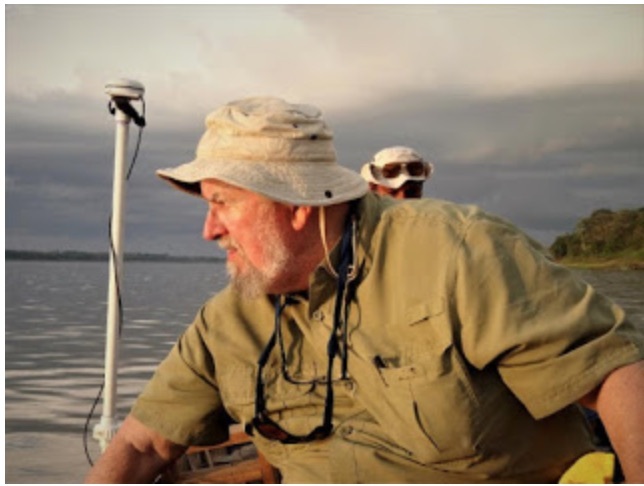 Octopress-- the PTMSC newsletter started several years after the non-profit was founded by Judy D’Amore and Libby Palmer – provides a wealth of anecdotal examples. One of the first compelling stories, recorded in the Fall 1986 Octopress, concerned a stranded harbor seal pup. Itti-Vik, a stranded harbor seal pup. Itti-Vik, as he came to be called by a caring group of 20 PTMSC volunteers, was abandoned by his mother in early July. With no formal training on how to deal with strandings, the group placed many phone calls to area veterinarians and seal researchers in order to collect information and develop a feeding schedule. In the process, they discovered Itti-Vik had been born prematurely. Taking shifts, the team worked around the clock to rehabilitate the pup, giving him electrolytic liquids, whole herring, a fat-protein supplement, vitamins and antibiotic injections. Eventually Itti-Vik’s care was turned over to a Kingston vet who had maintained a seal rehabilitation center for a number of years. The experience, retold in this 2012 blog post, was a tremendous learning opportunity for the PTMSC and its volunteers. 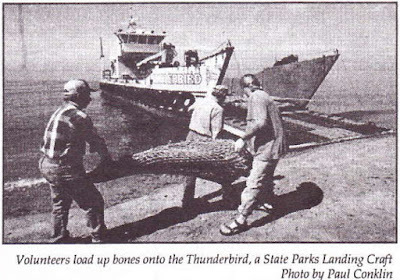 The National Oceanic and Atmospheric Administration had established the West Coast Marine Mammal Stranding Network (MMSN) in the early 1980s under the 1972 Marine Mammal Protection Act, but the MMSN rollout was still underway (the Northwest network was not formalized until 1992) when Itti-Vik was found. 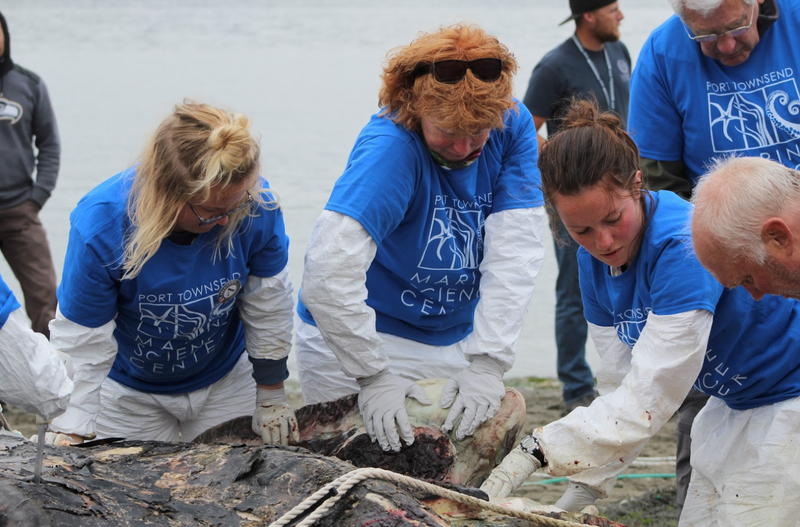 Armed now with the procedures to properly respond to marine mammal strandings, the PTMSC leveraged this episode to become one of the earliest MMSN response organizations in the Pacific Northwest. Of course, wild mammals living in and around the PTMSC were nothing new. 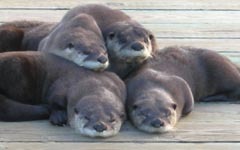 River otters, though not marine mammals, made their dens in the nearby hills and frequently used the floating dock adjacent to the Marine Exhibit as a play area. When not munching on crabs and sculpins caught below, the fun-loving animals took great delight in chasing each other around the dock, and still do to this day. 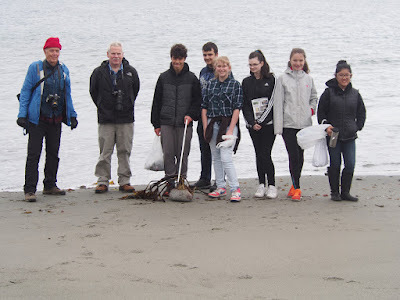 The activities of the otters, along with the many varieties of marine mammals, fish and birds that inhabit the Salish Sea, were the subject of PTMSC summer school programs for youths of all ages. 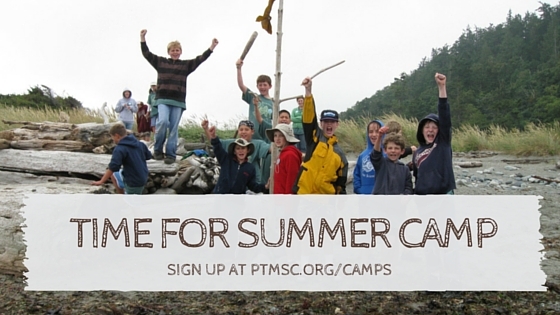 In fact, youth summer camps were one of the first and most enduring programs offered by the PTMSC. This summer, the Center offered two, one-week sessions of camp. We spent two very full weeks exploring the marine environment through observation and hands-on activities. 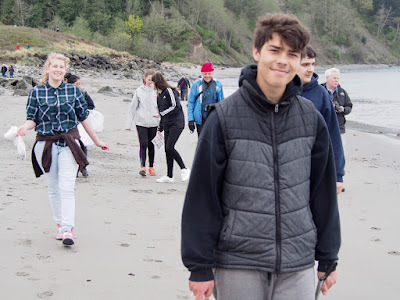 These activities included beach seines, fossil hunts, tide pool exploration, expeditions up Chimacum Creek to explore wild salmon habitat, and exercises and games to help define terms like “habitat” and “observation. The PTMSC also has a strong legacy of offering courses and lectures that provide adults in-depth knowledge about marine mammals and the ocean environment. For example, in the spring of 1996, PTMSC Educator Kay Addington-MacDonald launched a 7-week course, "Marine Birds & Mammals," that was offered through Peninsula College. The popular course was offered numerous times in the following years. The Winter 1990 Octopress told the story of a young orca whale found dead in Alberni Inlet in Barkley Sound, located on Vancouver Island in British Columbia. The dead cetacean was from the L pod (identified as L14), a teenage male 18-20 feet in length and weighing around 5,000 lbs. Although baseline levels of mercury in orcas had not been established at the time, a necropsy revealed L14 had extremely high levels of mercury in his liver and scientists suspected it was the probable cause of his death. 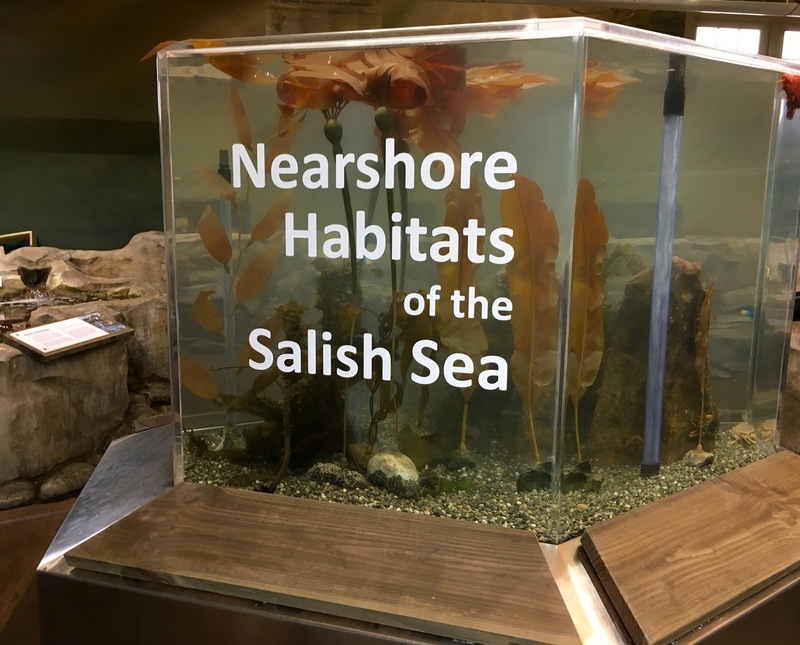 The account of L14’s demise was an eye-opener for the PTMSC, its supporters and the local community, revealing the many stresses—both environmental and man-made—that apex predators must withstand to survive in the Salish Sea. 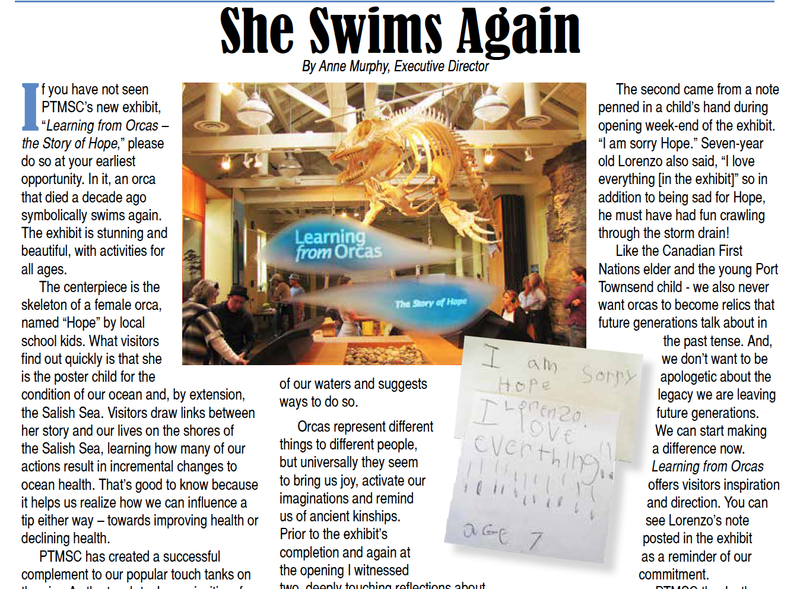 The tale also foreshadowed one of the PTMSC’s most ambitious educational projects, originating with a transient female orca (CA189) that beached herself near Dungeness Spit in 2002 and died shortly thereafter. The flensing (the practice of removing tissue from the skeleton of a carcass, especially that of a whale), necropsy and subsequent skeleton articulation was a major undertaking by the PTMSC and its supporters. 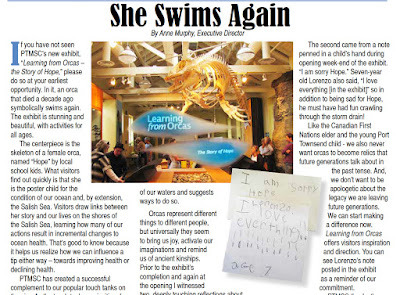 The Fall 2010 Octopress describes the extensive effort, including a significant campaign that eventually funded the refitting of the Museum to display the orca skeleton, named “Hope” following a community-wide naming contest. 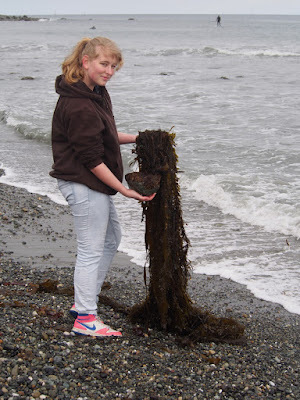 The Port Townsend Marine Science Center is pleased to announce the winner of a $1,000 Anne Murphy Ocean Stewardship Scholarship: Eliza Dawson. Dawson, 22, grew up in and around Port Townsend and spent many days volunteering at the PTMSC. A 2018 University of Washington graduate with a B.S. in atmospheric sciences, Dawson is undertaking an enormous challenge with three other women in June, rowing 2,400 miles from Monterey, Calif., to Honolulu in the Great Pacific Race (www.newoceanwave.com/great-pacific-race). A member of the UW crew in 2016 and 2017, Dawson and her teammates on Ripple Effect Rowing hope to break the world record for a women’s rowing team while simultaneously calling attention to the Great Pacific Garbage Patch, an enormous gyre of ocean garbage approximately 1.6 million square kilometers in size—more than double the size of Texas. “We continue to be inspired by Eliza!” said PTMSC Executive Director Janine Boire. “When she was 10, she and her younger sister were vital members of our Orca Project, preparing the bones of Hope the orca for display in our Natural History Exhibit. Dawson is raising funds and will document her journey with photos and videos on her blog, www.row4climate.com. The PTMSC awards the Anne Murphy Ocean Stewardship Scholarship annually to an East Jefferson County student or graduate who embodies the values that Murphy demonstrated in her 24 years as the organization’s executive director: curiosity, wonder and love of the marine environment. 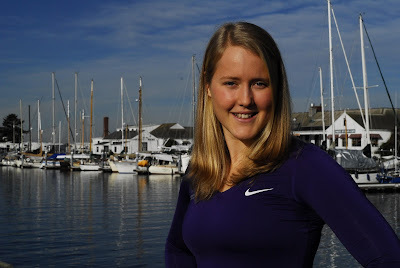 PTMSC will present Dawson’s scholarship award at a Row4Climate fundraising event at FinnRiver Cidery on April 27, 5:30 to 7 p.m. PTMSC invites others to match this award dollar-for-dollar and help Dawson reach her funding goal. On Saturday, April 21, volunteers from near and far will celebrate Earth Day weekend by picking up trash and debris along Olympic Peninsula coastlines during Earth Day Beach Clean Up. The annual Washington CoastSavers event is spearheaded locally by the Port Townsend Marine Science Center. Because the PTMSC is the only check-in site on the eastern side of the Olympic Peninsula, scores of people from around the region are expected to register at the PTMSC Natural History Exhibit before heading out to clean area beaches at Fort Worden State Park, Fort Flagler State Park, Fort Townsend State Park, Chetzemoka Park and North Beach. Check-in time at the PTMSC Natural History Exhibit is 11 a.m. and the debris receiving station closes at 5 p.m.
Once again, the Port Townsend Food Coop is offering valued support for Earth Day Beach Clean Up, providing $5 gift cards to be used the same day for all registered volunteers. More information, including participant pre-registration, is available on the PTMSC website at: https://ptmsc.org/index.php?mact=TeraEvents,cntnt01,show_event,0&cntnt01rid=400&cntnt01returnid=58#h1_anchor. This event was spearheaded by our very own Citizen Science Coordinator Betsy Carlson and organized by a committee of individuals from multiple organizations. Betsy Carlson and Julia Parrish leading a group discussion. Photo by SymPoint Communications. Dr. Joe Gaydos, science director of the SeaDoc Society, gave the keynote presentation and made the point that people are having a hard time knowing what to trust these days, but if citizens, and/or their friends and neighbors are involved in the research, they are more likely to trust the results. 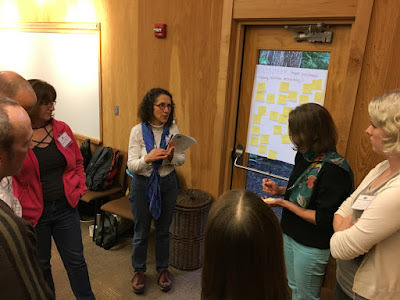 Some of the important topics that were generated by the group in the morning and then discussed more in depth in the afternoon were: access to information, collaboration and connection, communication, volunteers, and funding. 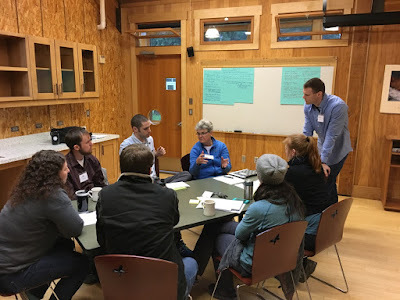 My Citizen Science AmeriCorps position at the PTMSC has been my introduction to citizen science, so this gathering was such a fantastic opportunity for me to get to learn from a passionate and dedicated group of people who have been working in this field for much longer than me. 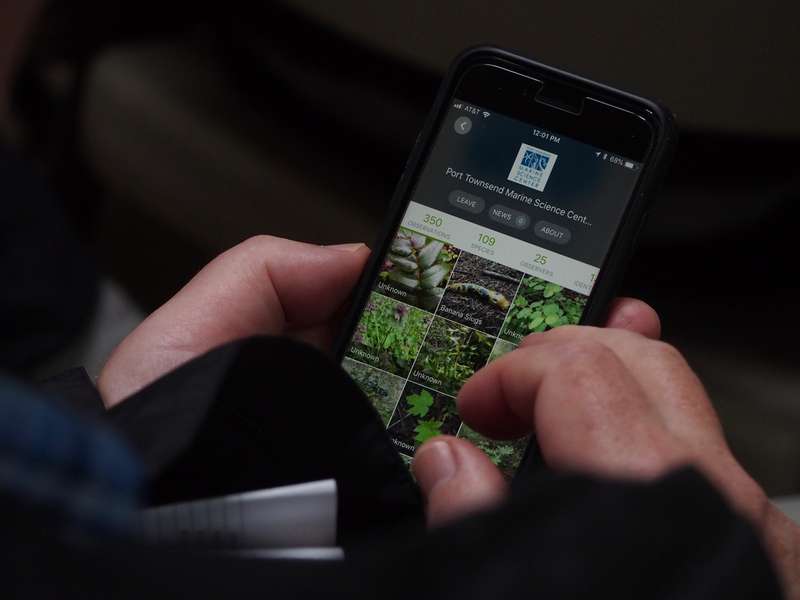 I have a relatively small role in the big picture of citizen science, so this was an opportunity for me to see what I am a part of and get a sense of the needs and goals of the citizen science community of this area moving forward. 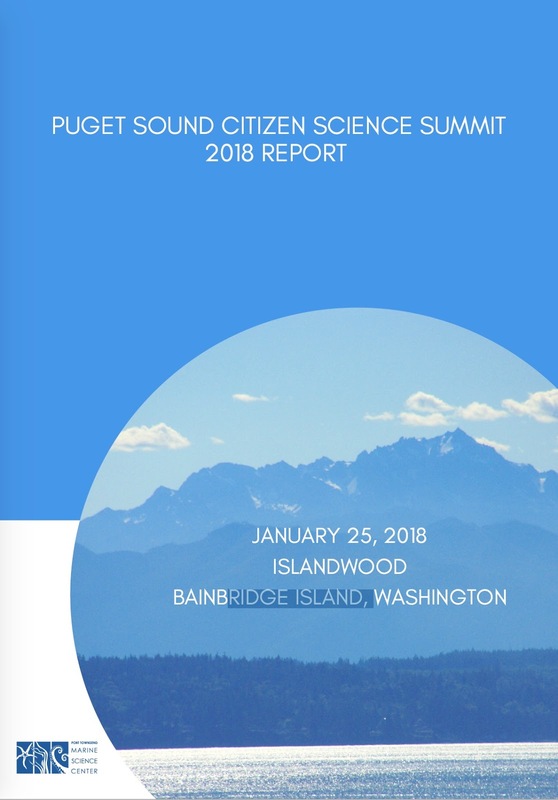 The attendees of the Puget Sound Citizen Science Summit who represented projects and programs reported working with over 5500 citizen science volunteers. What a Team! I feel proud to be a part of that team and am excited to see the growth and impacts of it moving forward. To read the full report from the summit, see [https://ptmsc.org/uploads/pdf/Science/citizen_science/2018%20Puget%20Sound%20Summit%20Report_4-9-2018%20orig%20size.pdf].